Keywords: Soil organic matter; nano-composite; clay fraction. Soil organic matter (SOM) has been studied in physical fractions (i.e., aggregates), chemical components (i.e., humic substances); and biological constituents (i.e., microbial biomass), or represented in kinetic compartments in simulation models (i.e., Century). In soils most organic matter is found as organo-mineral complexes, the interactions between inorganic and organic matter have been studied by Schnitzer and Kodama (1992). The physical domains of organic matter involve hierarchical units of aggregates and particle size fractions (Oades and Waters, 1991). The chemical domains involve chemically extracted humic substances (Schnitzer and Kodama, 1975), or several chemical classes of compounds in whole soil as characterized in mass spectrometry studies (Schnitzer and Schulten, 1992). The biological components and their interactions with inorganic matrices and organics control the flows of energy, carbon, nitrogen and other crop nutrients (Monreal and McGill, 1997). Another important component of organic matter is the soil solution, where chemical, biochemical and physico-chemical reactions occur (Monreal and McGill, 1997). The latter reactions affect supply of crop nutrients, the type of microbial communities, and molecular structures of soil organic matter (Monreal et al., 1997). In soil microsites organic matter binds to clay colloids and other minerals to form domains of nanocomposites at various arbitrary scales (< 1000 nm). Nano size materials are composed of nanoparticles characterized by a high surface-to-volume ratio. Various workers have offered potential mechanisms for the formation of nanoparticles in solutions, from those involving the classical nucleation and growth by addition of single atoms or ions, to those based on the growth of zeolites templated by organics involving 3 nm cubohectahedral clusters (Banfield and Zhang, 2001; Casey et al, 2001; Furrer et al., 2002; deMoor et al, 1995). In soil niches, nanomaterials are porous and hydrated and as such they control moisture retention, permeability, solute transport, and availability of plant nutrients in soils. These nanomaterials materials also control exchange reactions of dissolved inorganic and organic species between the soil solution and colloidal surfaces. The physico-chemical properties in the surface of nanocomposites provide much of reactivity to soil biological and abiotic processes (Navrotsky, 2004). With respect to organic matter, it is still uncertain how much of it may be found as pure molecular clusters (<0.5 - 2 nm) versus that found complexed with minerals in nanoparticles (2-100 nm), nano-composites (100-1000 nm), or microcomposites (>1000 nm). On the other hand, bacteria may be considered as single domain microparticles or nanomolecular catalytic assemblies. Living communities of microorganisms in soils produce and utilize diverse nanoparticles during their metabolic reactions of oxidation and reduction of growth and energy synthesis (35). Thus, the microbial-soil-plant interaction taking place at nanosites in rhizospheres may influence the stabilization of organic matter and the availability of nutrients for crop use. At present, little is known about the chemistry and dynamics of organic matter in the soil solution of crop rhizospheres and in nanocomposites of the clay fraction. This knowledge is necessary in order to elucidate processes that control the storage of atmospheric carbon in soil organic matter and the supply of nutrients for crop use in the soil rhizosphere. The objective of this article is to describe and characterize the chemistry and kinetics of organic matter in the soil solution of wheat rhizosphere and in nanocomposite and clay fraction of a cultivated soil. These results are to be compared with published information on the nature of organic matter in soil solutions and aggregate fractions. In this article, the characteristics of organic matter in three soil compartments (i.e., soil solution, clay and nanocomposites) were determined in separate studies. A recent study has been initiated to determine the chemical composition of organic molecules in the soil solution of a cultivated Gleysol. A soil pot replicated study involves extracting the solution from the rhizosphere of wheat grown in a loamy sand Gleysol and from unplanted soil pots. The experiment was carried out in the greenhouse under controlled conditions of moisture and temperature until wheat reached maturity. The soil solution from wheat rhizosphere and from unplanted soil pots was obtained once a month. Roots were separated from soil by hand. Soil samples were then passed through a 2 mm sieve. The soluble pool was extracted by shaking soil samples taken from the rhizosphere with dilute KC1 (0.01 N) for half an hour. The supernatant was then passed through a micropore (<0.2. μm) fibreglass filter, and stored frozen until chemical analysis. A separate study involved collecting composite soil samples from the A horizon of a cultivated Black Chernozem in Saskatchewan. 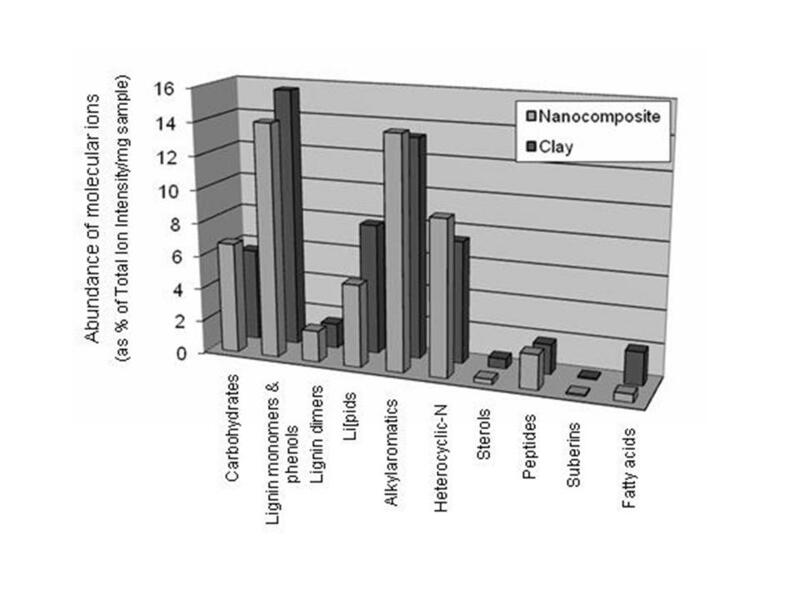 The clay fraction of soil samples was obtained after sonication and sedimentation as described by Monreal and Kodama (1997). The clay fraction was shaken and dispersed repeatedly with sodium hexametaphosphate to obtain a nanocomposite fraction. A nanocomposite sample (< 250 nm) was obtained by centrifiigation at high speed (4800 rpm) based on the particle sedimentation and centrifugal acceleration scheme of Tanner and Jackson (1947). The chemical characterization of soil organic matter in soil solution was done by Chemical Ionization Electrospray Mass Spectrometry, and in the nanocomposite fraction was done by Pyrolysis Field Ionization Mass Spectrometry (Py-FIMS) as described by Monreal et al. (1997). The dynamics of organic matter in the clay and nanocomposite fractions were characterized using the kinetic concepts of mean residence time (MRT) and organic carbon turnover as described by Monreal et al. (1997). The age or MRT was determined using radiocarbon dating by the IsoTrace Radiocarbon Laboratory of the University of Toronto in 2007. Figure 1 shows the ESMS spectra for soil solution (extracted with 0.01 N KC1) collected from the rhizosphere of wheat during the late booting stage and from a soil pot after 46 days of incubation in the greenhouse. Noteworthy, the total number of molecular ions (Til) is ten times greater (i.e., 28,400) in the solution obtained from the soil rhizosphere of wheat than in the solution extracted from soil alone or non-rhizosphere soil (2,090)(Figure 1, Table1). The latter was also paralleled by greater diversity of organic molecules in the rhizosphere than in non-rhizosphere soil solutions. The same trends in diversity and number of molecular ions were observed for rhizosphere and non-rhizosphere soil solution during other stages of crop growth (i.e., tillering, flowering and maturity; data not shown). According to Table 1 and Figure 1, the most abundant classes of compounds in the soil solution of the rhizosphere during the booting growth stage of wheat were heterocyclic-N and amino acids followed by carbohydrates and lignin monomers and other aromatics, a nucleotide, ketones and aldehydes. Most heterocyclic compounds involved pyrazole (m/z 68), pyrazoline (m/z 70), pyrazine (m/z 80), and several derivatives of pyrrole (m/z 69, 81, 97, 109, 123, 137), methylpyrazole (m/z 82), hydroxypyrrolidone (m/z 85), methylpyridine (m/z 93), methylpiperidine (m/z 99), pyridineamine (m/z 104), benzimidazole (m/z 118), and quinoline (m/z 129), methylquinoline (m/z 143) and dimethylquinoline (m/z 171). The solution extracted from the rhizosphere contained several amino acids such as glycine (m/z 75), alanine (m/z 89), formylhydroxyglycine (m/z 101), serine (m/z 105), proline (m/z 115), valine (m/z 117), cysteine (m/z 121), hydroxyproline (m/z 130), leucine (m/z 131), asparagine (m/z 132), histidine (m/z 155); propylamide (m/z 73) was also found. Carbohydrates derivatives included pentoses such as hydroxyfuran (m/z 84), dimethylfuran (m/z 96), acetamidofuran (m/z 125); trioses such as glyceraldehyde (m/z 90); furanones like aminomethylfuranone (m/z 113), aminoethylfuranone (m/z 127) and aminopropylfuranone (m/z 141); other carbohydrate like derivatives included methylfurfuraldehyde (m/z 110) and 3-hydroxypenteno-l,4 lactone. Ketone such as butanone (m/z 72), and aldehydes such as hydroxypropanal, hydroxybutanal (m/z 74 and 88) were also found. Nucleotides involved primarily cytosine (m/z 111), uracil (m/z 112) and thymine (m/z 126). All these compounds are important constituents of microbial and plant cell tissues, and may be also associated with root exudates and compounds of metabolism during crop growth or microbial cell lyses. In comparison, the non-rhizosphere solution presented fewer and less diverse molecular species than the solution obtained from the wheat rhizosphere. According to Table 1 and Figure 1, heterocyclic-N, carbohydrates, and lignin monomers and other aromatics were the most abundant classes of compounds in the solution extracted from the non-rhizosphere soil during the booting growth stage of wheat. Heterocyclic compounds involved pyrazoline (m/z 70), diethylpyrazine (m/z 137), decyl- and undecyl-pyrrole (m/z 207 and 221), other N-compounds (m/z 229, 265), and adenosine (m/z 267). Carbohydrate derivatives included acetamide (m/z 59), and the ketone pentanedione (m/z 100) was also observed. Ketone such as butanone (m/z 72), and aldehydes such as hydroxypropanal (m/z 74), hydroxybutanal (m/z 88), hydroxyketobutanal (m/z 102) and coniferylaldehyde (m/z 178) were also found. Prominent signals of lignin monomers and other aromatics included methylnaphthalene (m/z 142), dimethoxybenzonitrile (m/z 163), ferulic acid (m/z 194), and tridecybenzene and methyl-sinapyl alcohol (m/z 224). Figure 1. Electrospray mass spectra (M+H) for organic matter in the solution obtained from the soil rhizosphere of wheat (A) and from the solution obtained from a soil pot with no wheat planted (B). The soil solution was collected during the late booting stage of wheat before heading (46 days after planting date). These results clearly indicate that the presence of crop roots influence the size and diversity of the molecules cycling through soil solutions. The mechanisms controlling the latter are unknown, but they may be associated with the amount and type of organic matter exuded from roots or secreted by active microbial cells, by the amounts adsorbed onto solid surfaces in organo-mineral complexes, and/or associated with the turnover of compounds in the soluble pool. In soils, the number and the amount of roots rapidly increase during the vegetative stages of crop growth and reach a maximum at the heading stage (Inada, 1967). Alberda (1953) indicated that root mats start to develop at the end of the tillering stage and last until the ripening stage. In addition, crop and root growth is accompanied by the exudation or organic materials in the rhizosphere (Rovira, 1956). The chemical compounds in root exudates act as regulators of microbial growth and function, and contain molecules which directly control the rhizosphere processes that enhance soil N mineralization and crop nutrient uptake and assimilation (Dakora and Phillips, 2002). Barber and Gunn (1974) showed that 5-9% of total plant weight was released as root exudates. Barber and Martin (1976) reported that wheat or barley root exudates could comprise 7-13% of the total dry matter in axenic plants growing in soils, and that non-sterile soil root exudates accounted for 19-25% of the dry matter produced. Most root exudation studies have been conducted in hydroponics and axenic sand culture and in the absence of soil (Darwent et al., 2003; Rovira and McDougall, 1967). Root exudates consist of sugars, amino acids, vitamins, organic acids, nucleotides, fungal stimulators and inhibitors, enzymes and other compound classes (Dakora and Phillips, 2002). Further research is warranted to explain the mechanisms and factors inducing the differences in chemical composition between the soil solution obtained from the rhizosphere and non-rhizosphere soil. A separate study was also conducted to chemically characterize the organic matter in the clay and nanocomposite fractions of a Black Chernozem. The total number of molecular ions detected by the mass spectrometer was three times higher in the clay fraction (9.38 x 106 counts/mg) than in the nanocomposite fraction (3.36 x 106 counts/mg sample). 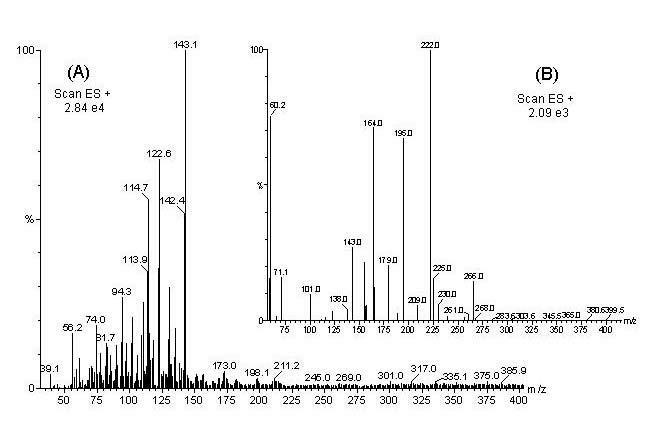 Figure 2 shows that the m/z signals detected by Py-FIMS were assigned into carbohydrates, lignin monomers and phenols, lignin dimers, lipids (alkanes, alkenes and n-alkyl esters) alkylaromatics, N compounds, peptides, sterols, peptides, suberin and fatty acids. The clay fraction has a relatively higher content of lignin monomers and phenols, lipids, sterols and fatty acids than the nanocomposite fraction. Conversely, the nanocomposite fraction showed higher relative abundance of carbohydrates, heterocyclic-N, peptides and alkylaromatics than the clay fraction. On average, the maximum evolution of pyrolysis products of organic matter in the clay fraction occurred at 360 to 370°C and those in the nanocomposites occurred at 390 to 410°C (data not shown). Carbohydrates, heterocyclic-N and alkylaromatics in nanocomposites were released at higher temperatures than the same compound classes in the clay fraction. This indicates that these components of organic matter are held more strongly in the nanocomposite fraction through preferential interaction with inorganic components. The exact inorganic components in this sample were not determined and mechanisms for these reactions are unknown. A study was conducted to examine potential age differences between the soil carbon associated with the clay and that associated with the nanocomposite fraction of a Black Chernozem. Radiocarbon dating shows that the average age of organic carbon in the nanocomposite and clay fractions were similar. The average carbon age (before present) was 1200 ± 170 years in the nanocomposite and 1090 ± 130 years in the clay fraction (Table 2). These results indicate that the organic matter in the clay fraction of the Black Chernozem involves the storage of carbon with similar residence time in nanocomposites < 250 nm. In comparison, the age of organic carbon in microaggregates < 50 urn was 275 yr and < 100 yr in macroaggregates >250 urn (Monreal et al. 1997). The qualitative nature of organic matter in the clay and nanocomposite fractions is similar to that published for macro and microaggregates of a Gleysol (Monreal et al. 1997). It remains to be determined whether the age and chemical structures turnover of carbon reported for the nanocomposite fraction < 250 nm is similar to that found in smaller nanocomposite fractions (i.e., 50 to 100 nm or 10-50 nm), or in pure molecular clusters (0.5 -2 nm) if they exist in-vivo soils. The hierarchical model of aggregates with associated particle size fractions provides a consistent approach to study soil organic matter dynamics and the mechanisms controlling its stabilization and chemical quality. In summary, results from these two studies and those obtained from earlier published work show that organic matter involves the same ten classes of chemical compounds in nanocomposites, clay, macro- and micro-aggregate fractions in soils with different parent material, pedogenesis and inorganic matrices. Main differences in the nature of soil organic matter in solid fractions appear at the level of individual molecules and the energy of stabilization by inorganic colloids in scales ranging from hundreds of nanometers to hundreds of micrometers. In comparison, the organic matter in soil solution comprises fewer chemical classes and showed to be less diverse than in soil physical fractions ranging from nanometer to micrometer scale. Figure 2. Chemical classes of soil organic matter in the clay and nanocomposite fractions of a cultivated Black Chernozem as characterized by Pyrolysis Field Ionization Mass Spectrometry. 1. The soil solution has from five to seven chemical classes of molecular ions (m/z <250 da) involving heterocyclic-N, amino acids, carbohydrates, lignin monomers, phenols, nucleotides, ketones and aldehydes. The organic matter in soil solutions extracted from wheat rhizosphere is more diverse and abundant than non-rhizosphere soils. 2. The organic matter in the clay and nanocomposite <250 nm fractions consisted of ten chemical classes of molecular ions (m/z <550 da) involving carbohydrates, lignin monomers and phenols, lignin dimers, lipids, alkylaromatics, heterocyclic-N, sterols, peptides, suberins and fatty acids. The organic matter in the nanocomposite fraction had relatively higher content of carbohydrates, lignin dimers, alkylaromatics and heterocyclic-N.
3. The age of soil organic carbon in the nanocomposite < 250 nm fraction was 1200 years and similar to that in the clay fraction which was 1090 years old. was more stable and The residence time of carbon in clay and nanocomposite fraction was slower than in macro- and micro-aggregates.